How do I know if I’m entitled to compensation? What is a Conditional Fee Agreement (CFA) and how do I sign it? How do I sign a Power of Attorney (PoA) or a Conditional Fee Agreement correctly? What is a Power of Attorney and why do you need it? My Customer Dashboard shows that you received my document. Why do you keep requesting it? I can't login, what can I do? Why do you need a copy of my ID or Passport? What happens to my documents once you have them? Are they secure? What is a flight confirmation and where can I find it? What’s a booking reference and how can I find it? What is a “rerouting confirmation” and where can I find it? I don’t have my e-ticket/boarding pass anymore, what do I do? Who should sign documents on behalf of minors? You asked me to send some documents - how do I do that? Why are you asking me for so much information? Do you share my information with others? What happens to my documents once you have them? Is it secure? Why does AirHelp need documents such as an e-ticket or ID? Why does AirHelp need an assignment form? Is there any possibility that linking my email account could compromise my security? Can I remove the automatic import feature from my email at any time? Which documents do I need to provide in order to claim? The Conditional Fee Agreement (CFA) is a document that grants AirHelp the power to represent you in court in the UK. We need it to claim compensation from the airline, and collect it on your behalf. Please read the entire document carefully, fill in all the required fields, and sign it. This document can be signed online via HelloSign. We also accept a printed and signed version of the document, if that is preferable to you. You just need to make sure the document is complete and readable. If any part is cut, edited, blurred, the document will be rejected and our flight disruption experts will ask for another one. In order for us to accept the document, please make sure you have read it carefully and that every field is properly filled out. We will specify if the document needs to be signed by hand, or if you can sign online. The Power of Attorney (POA) is a legal document that grants AirHelp the power to represent you in court and to initiate legal proceedings against the airline. It can be given different names such as ‘Power of Attorney’, ‘Conditional Fee Agreement’, ‘Certificate of Authorization’, or ‘Special Assignment Form’, depending on the jurisdiction. Please read the entire document carefully, fill in all the required fields, and sign it by hand. Note that a Conditional Fee Agreement can be signed either by hand or electronically – a link to sign online will be sent to you. This issue can happen from time to time. When you receive a second request for a document, it usually means that there was an issue with the original document you provided. It could be that the documents weren’t in the correct format and we couldn’t open them, or that the information on the documents wasn’t clearly visible. Note that if you have sent the documents to us via email or chat, it can take a while for these documents to show on our system. To ensure your claim is processed quickly, always upload documents to your dashboard. If you are still receiving multiple requests from us even after resubmitting your documents, please head over to our Contact Form or Live Chat. Our experts can help you resolve the issue. If you are having trouble logging in, first make sure that you are using the same email address and password you used while submitting your claim. They should both be free of any typos. If you can’t remember your password, you can reset it by following this link. You will receive instructions to reset your password via email. In case you are still having problems logging in, you can contact customer support via our Live Chat. We only request a copy of a personal identification document in order to meet a requirement of a third party involved in the claim process. For example, the airlines and/or courts. Some airlines need ID to validate the authenticity of the Assignment Form, while courts need it to validate the power of attorney. At AirHelp, we take your privacy very seriously and all personal data is stored securely. We will never share it with any third parties other than the operating airlines and the judicial bodies (where applicable) without your prior explicit consent. We are also compliant with all the EU data protection regulations, including the General Data Protection Regulation (GDPR). 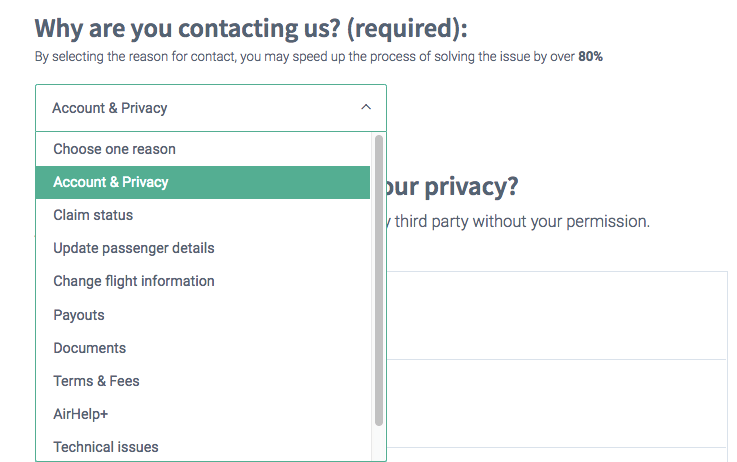 We take your privacy very seriously. Therefore, we would like to assure you that our data protection policy on the processing, sharing, and storing of personal information is fully compliant with all EU data protection regulations, including the General Data Protection Regulation (GDPR). Your flight confirmation is the written confirmation that you were a passenger on the flight in question. It may also be referred to as a ‘Booking Confirmation Document’ or ‘e-ticket’. It will contain your booking reference number, passenger details and flight details. You can find your flight confirmation in the emails or documents the airline (or travel agency) provided when you purchased the flight. A booking reference is a unique code used by the airline to identify your reservation on their systems. It can be found on your booking confirmation email and e-ticket. It may appear under different names such as ‘booking reference’, ‘reservation reference’, ‘booking code’, or ‘PNR’ (Passenger Name Record). In case of any doubt, just upload your booking confirmation and our experts will identify the correct booking reference. If you experience a flight cancellation or your flight is overbooked, the airline should offer you an alternative flight. They may also refer to this as a rerouting to your final destination. The rerouting confirmation can be an email, or SMS, sent by the airline informing you about your flight disruption and offering an alternative flight. It will often include the e-ticket or boarding pass for that flight. E-ticket: Your e-ticket should have been emailed to the address you provided when you booked your flight. So unless you know you’ve deleted it, you should still have a copy of it in your email. Try searching for the airline’s name in your inboxes and your trash folder. If you can’t find it, you can try downloading your e-ticket again after logging into the airline’s website, or contacting your airline’s customer support and asking for a copy. Boarding pass: Certain airlines and courts require a boarding pass in order to process your claim. If you’re no longer able to download a copy of it by logging into your airline’s website, please contact the airline directly (or the Online Travel Agency you used to book the flight). Ask for a Boarding Certificate, which is equivalent to a boarding pass and can legally be used to process your case. If your claim includes a passenger who is under the age of 18, all documents will need to be signed by a parent or legal guardian on their behalf. The parent or guardian should add the following annotation alongside their signature: “on behalf of [child’s name]”. Some documents must be signed by both parents — we understand this isn’t always possible. In this case, please contact our friendly customer support via our Live Chat so our experts can help you find a solution. After you have filed a claim with AirHelp, our experts will get in touch and ask you to upload some documents relating to your disrupted flight. It only takes a few minutes, and will give us the evidence we need to build your case against the airline. Log in to your Customer Dashboard. Click on the ‘Add Documents’ button and select the files you want to add from your computer. When you are done uploading all of the documents, click on the ‘Submit Now’ button. Please note: the Customer Dashboard supports PNG, JPEG and PDF formats only. Once the upload is complete you can see the names of the documents we have received from you under the ‘Uploaded documents’ header. You can also check if there are any documents we still need under the ‘Additional documentation needed’ header as shown below. Note that some documents may require your hand-written, scanned signature. Please check the relevant instructions we send you via email. We understand filling in forms and finding documents is a hassle – so we’ll keep your paperwork to a minimum by only asking you for the information that is essential to your claim. Depending on the airline and the court jurisdiction, the paperwork required may differ – and some claims do require multiple documents. If you find yourself stuck or have any questions regarding the documentation you need to provide, our customer support team will be happy to assist you via our Live Chat. Of course. The AirHelp Team can update your contact details for you at any time. To update your email address, telephone number, or home address simply log in to your Customer Dashboard and fill out our Contact Form. Make sure you select the ‘Update passenger details’ option, so we can process your request faster. Alternatively, you can contact our friendly customer support via our Live Chat. We’ll be very sorry to see you go, but respect your decision. If you ever experience a flight disruption in future, you know where to find us. Your account details and any data we have stored will be completely removed from our database within 30 days from your request. During the claims process, we need to share certain information with third parties, for example, airlines or lawyers. Your data is only shared with third parties whose job is to bring your claim to its conclusion. Flight documents allow us to confirm your flight details. They are also required by third parties such as airlines and the court, who may ask for your boarding pass as proof that you checked in or boarded the plane, for example. An Assignment Form is an essential document that allows us to legally represent you and make a claim for compensation with the airline on your behalf. If you are the main claimant you will be asked to sign this form during the claim submission process. Please make sure to read the form carefully and to sign it before submitting it. 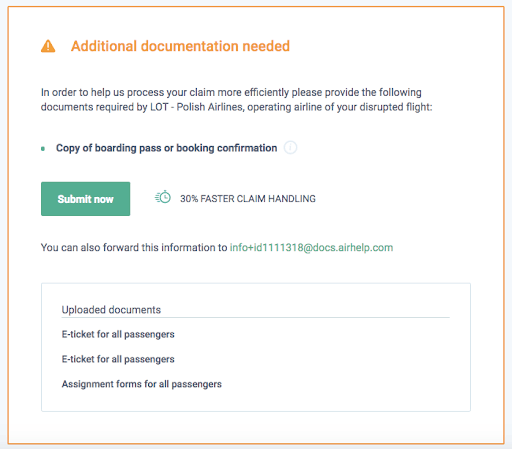 Where there are fellow passengers listed in a claim, we will send a follow-up email requesting that each of them sign a separate assignment form. This form is required for each passenger listed in the claim so that we can act as their legal representatives during claim processing and compensation handling. Not at all. The protection of your data is our top priority. AirHelp has established security measures that comply with the latest EU regulations on data privacy. As part of this initiative, AirHelp’s handling of private data is certified by Norton, TRUSTe, Google and Microsoft. Sure, that’s no problem. Simply follow the instructions below, depending on your email provider. If you have a Google account, go to https://myaccount.google.com/permissions, select AirHelp and click “Remove Access”. If you have an Outlook or Hotmail account, go to https://account.live.com/consent/Manage. Select “Edit” under AirHelp and click “Remove These Permissions”. To claim your compensation, we need some essential documents: your flight e-ticket and signed assignment forms for you, and any fellow passengers listed in your claim. We may also ask for some additional documents while processing your claim, such as your boarding pass, personal ID or passport, power of attorney, and/or conditional fee agreement. This will depend on the requirements of other parties involved, such as the airline, and in some cases, the courts and lawyers. If you have a claim with AirHelp, log in to contact us.